An $18 million stone crushing plant has begun its operation on a 10-acre site in Dawasamu, Tailevu. The company, Gold Rock Investments Limited, is the largest crushing plant in Fiji. Gold Rock specialises in crushing river basalt rock and all products are tested by International Accreditation New Zealand labs proved it to be the most enduring to use in road construction projects. 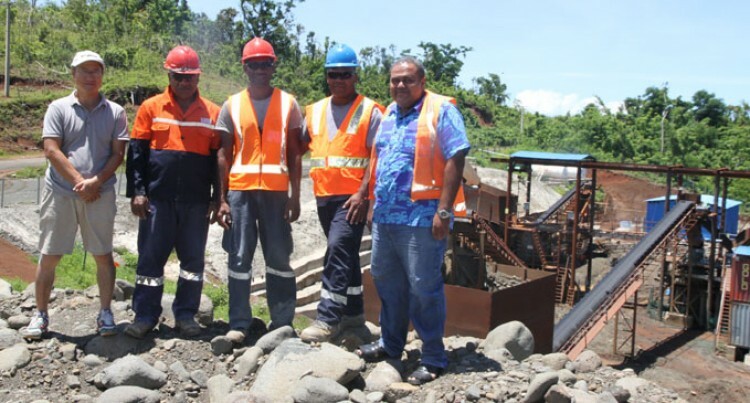 It is supplying crushed stones to major road contractors in Fiji. “All materials used are compliant, have been tested by qualified engineers and we are now supplying to major road and asphalting contractors,” general manager Joseva Gavoka said. Mr Gavoka said during normal production hours they had the capacity to crush 500,000 cubic meters of stone per year. “Our plant can manufacture and crush basalt rocks at a minimum of 1200 cubic metre per day. “This is with all products ranging from 65mm sub-base, 40mm base course, 20mm sealing chips, 14mm sealing chips, 10mm sealing chips, 7mm sealing chips and dust. Mr Gavoka said their main aim was to keep specialising in aggregates. “We engage in an uncompromising testing and quality control regime to ensure that the products we manufacture, maintain our reputation for supplying the South Pacific’s premium quality crushed basalt rocks,” he added. The plant, according to Mr Gavoka, has generated jobs for the local residents. He thanked the Government’s tax-free zone initiative and the mataqali Naboro and Nadureni for giving their land and resources to set up the plant. The machines used in the plant are manufactured by a subsidiary of Metso Group from Finland which specialises in the manufacturing of mining machinery in the world. Gold Rock Investments Limited is a fully-owned and registered Fijian company.